Economic Overhead Conductor Software (EOCS) is a software tool that assists engineers and system planners in evaluating new and existing conductor installations. 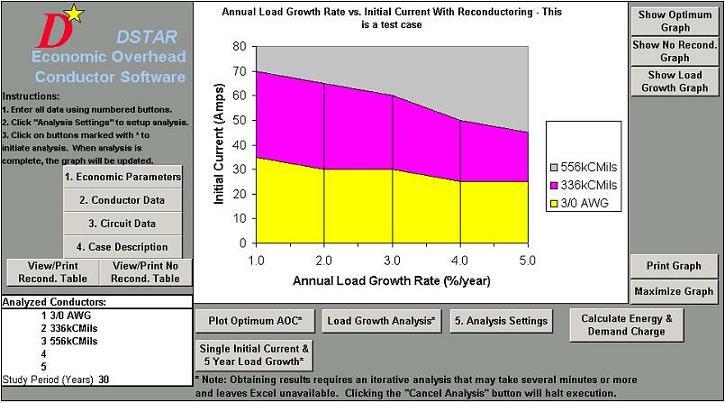 The software considers parameters such as: average construction cost per mile, average re-conductor cost per mile, fixed charge rate, escalation rate, loss factor, demand charges, minimum acceptable rate of return (interest rate), loss cost per amp, conductor thermal limit, growth rate, initial load, present conductor in-service, and conductor replacement . This tool shares many of the features that have become popular and useful in past DSTAR software products such as online help and popup entry windows. Your company’s administrator for this program has preloaded the software with the appropriate conductor information and economic parameters. Historically, there has been little attention paid to economically evaluating the application of overhead conductors. Line losses, thermal limits, and voltage concerns have been the primary considerations in applying overhead conductors. This practice has often led to the use of conductors that are either oversized or undersized for their future operational environment. Using a rigorous economic approach for evaluating conductors, which includes future load growth and utility economics, can have a tremendous impact on the conductor and future re-conductoring selection process.